Protect Alaska's Bears from the Pebble Mine! 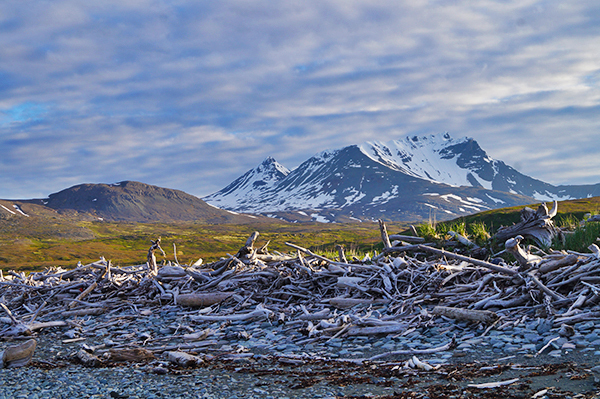 It’s exactly the kind of wild natural scenery you envision when you picture “Alaska”—snow-capped peaks towering above a placid creek that gently winds its way through a verdant valley in the remote wilderness of the Alaska Peninsula. The only constant sound is that of the ocean waves steadily breaking against the sandy shore of Amakdedori Beach. Whenever your gaze wanders eastward out past the rugged coastline, your eyes are immediately drawn to the conical volcano atop nearby Augustine Island, cloaked in a blanket of snow. 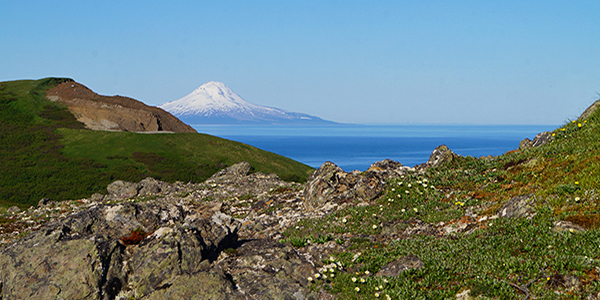 Looking south across Kamishak Bay, the glaciated volcano known as Mount Douglas rises more than 7,000 feet up into the clouds, dwarfing the other mountain peaks that surround it. The late afternoon light illuminates the vertical rock face of McNeil Head and brings Nordyke Island and the shores of nearby Katmai National Park & Preserve into view. Ashore on the tundra along Amakdedori Creek, brown bears, moose, wolves, ground squirrels, and red foxes feed on abundant sedges and berries as they roam among the alpine grasses and profusion of wildflowers such as angelica, fireweed, forget-me-nots, and lupines. Just offshore, harbor seals, humpback and beluga whales, sea otters, and salmon swim in the Kamishak Bay waters that are so often swept up by powerful winds blowing in from the Gulf of Alaska. Bald eagles float on the thermals overhead, while trumpeter swans, black-footed kittiwakes, mergansers and many other birds feast upon the bounty of the bay and creek. If you happen to visit on one of the rare sunny days at Amakdedori, you might be forgiven for thinking that this place is paradise on Earth. But this paradise may soon be lost. The Pebble Partnership recently proposed developing an industrial port at Amakdedori Creek that could destroy this pristine wilderness area and jeopardize the delicate balance between wild bears and humans that has been so carefully cultivated in this region for more than 50 years. The proposed port would connect to a new 35-mile, two-lane highway that would skirt the boundary of McNeil River State Game Sanctuary & Refuge, cutting through prime grizzly bear habitat en route to a new ferry terminal on the south side of Lake Iliamna. This industrial corridor would cross more than 200 salmon streams, bisecting brown bears’ travel corridors along the Alaska and Aleutian mountain ranges and fragmenting the bears’ wild habitat. The heavy truck traffic along the road would also pose a serious threat to the safety of any bears that decide to cross it. In addition, the food and waste produced by Pebble employees and contractors in the area would be a tantalizing attractant for bears, greatly increasing the likelihood that the region’s wild bears would become food-conditioned and even killed. All of this would add up to significant changes in the ways that wild bears in McNeil River, Katmai National Park, and beyond perceive and interact with humans. Alaska’s bears could begin to view human activities as threatening and change their behaviors accordingly. These coastal grizzlies could alter their travel routes and may start to avoid contact with humans entirely, greatly diminishing the bear-viewing opportunities available throughout the Alaska Peninsula and threatening the viability of the region’s thriving bear-viewing ecotourism industry. Yet somehow, Pebble Partnership’s current permit application doesn’t even mention bears, nor does it address the serious human-wildlife conflicts that are likely to occur at both the Amakdedori Port and the transportation corridor between the port and Lake Iliamna. 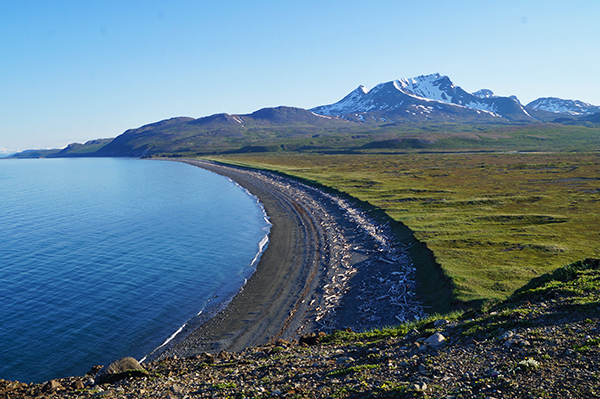 The proposed Pebble Mine transportation corridor would cut through this wild expanse of tundra, severing a migration route for coastal grizzly bears along the Alaska Peninsula. Since the Amakdedori Port and transportation corridor were late additions to the Pebble Mine permit application, Pebble Partnership has not yet provided baseline environmental or economic data for those newly proposed facilities. Constructing the port and roadway without a complete understanding of how they might affect the interconnected ecosystems of the Alaska Peninsula (as well as the Alaskan economy) would be irresponsible, and the U.S. Army Corps of Engineers should not issue a Draft Environmental Impacts Statement (EIS) without first requiring that Pebble Partnership provide more detailed baseline information and produce an in-depth review of the potential impacts to brown bears, salmon and other wildlife in the area. At Natural Habitat Adventures, we believe that wildlife and wild places are worth protecting, and there are few places in North America that deserve more stringent protections than the home of the world’s largest seasonal congregation of the biggest brown bears on the planet. There is an average of of one bear per square mile at McNeil River State Game Sanctuary & Refuge during the peak summer bear-viewing season, and these wild bears’ home ranges can extend up to 100 square miles along the Alaska Peninsula. It would be reckless to consider building the proposed Amakdedori Port and transportation corridor just outside the boundaries of this world-class wildlife viewing destination without fully understanding the potential impacts on brown bears. Nat Hab has been leading small-group adventures to view the world’s largest coastal grizzly bears in Katmai National Park & Preserve since the early 1990s, so we can attest to the fact that this summer grizzly gathering is a natural treasure worth protecting. To help better quantify this state and national asset, WWF’ is in the process of commissioning a study of the economic value of bear tourism in southwest Alaska. 2018 marks the 100-year anniversary of Katmai being designated as a national monument in 1918, so this year’s centennial celebration is the perfect occasion to solidify our country’s commitment to conserving this wild region so that bears and people can continue to coexist for many generations to come. 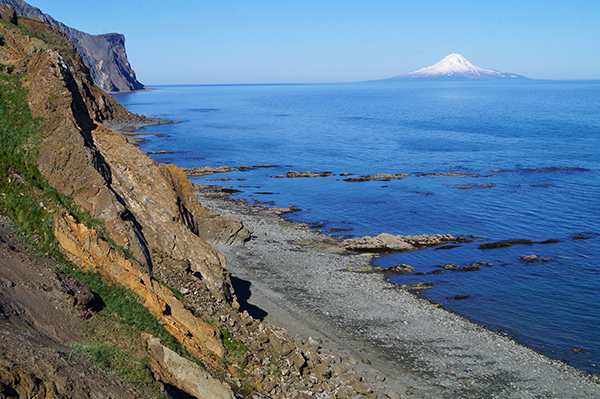 To support the protection of nature and wildlife on the Alaska Peninsula, Nat Hab and World Wildlife Fund helped finance a small expedition team to visit Amakdedori Creek this June and gather baseline information about this pristine natural environment. 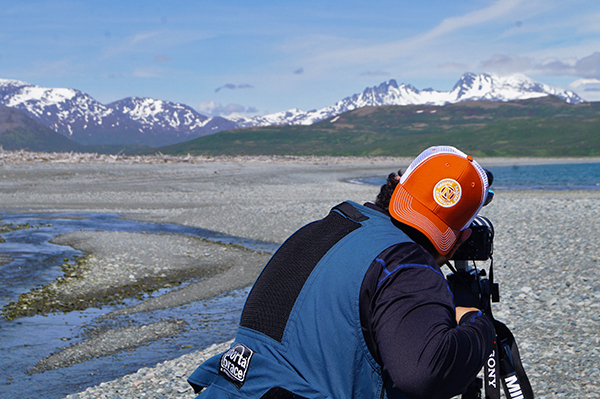 Lead by Alaska bear guide Drew Hamilton, our small group spent four days and nights hiking and camping along this wild section of the Alaskan coastline, documenting the wildlife and wild natural setting that we encountered at Amakdedori. Within two hours of our plane landing on Amakdedori Beach, we spotted a grizzly bear sow grazing on sedges atop a hillside across the creek, less than half a mile from the site of the proposed port. We watched as the bear made her may slowly up over the hill, glancing over at us occasionally, before she ambled out of sight. We also found a section of sedges near the creek that had recently been grazed by a bear and came across numerous bear tracks of all sizes while walking along the beach. Along with paw prints from gray wolves along the beach, our group also saw several red foxes: on the tundra near the creek, on the beach, and on the driftwood piles. The number of skeletons of sea otters, river otters and various birds we found (in addition to the ample floral food sources) indicated that the food prospects for carnivores in this area were quite good. Several people familiar with the area told us that there is a salmon run up Amakdedori Creek each summer. From our camp on the opposite side of the berm from the beach, we watched several pairs of ducks and swans fly low over the calm waters of Amakdedori Creek, and saw bald eagles catching the rising thermals in the sky above. We witnessed flocks of many species of wild birds in the sky, on the creek, and out on the waters of Kamishak Bay. A lone bald eagle often stood sentry from its perch atop a nearby cliff. We passed abandoned and active ground squirrel colonies nearly everywhere we walked on the tundra, and even saw a moose cow grazing on a hillside across the creek. One of our most exciting wildlife sightings came in the dim light of dusk after midnight on our second night of camping—first, a curious harbor seal popped its head up out of the (temporarily) calm waters just offshore, and then about five minutes later, I saw what looked like a whale fluke rise up out of the ocean just 25 yards out from the beach. Moments later, we heard the sound of a giant exhale and saw the mist spouting from the blowhole of a humpback whale! We were all utterly amazed at how close the whale came to our campfire, so imagine our surprise and delight when we saw the same whale return the following night! Our group also hiked past miles of sun-bleached driftwood piled up above the high-tide line, clear evidence of the powerful storms that Amakdedori Beach is locally known for. This is the most exposed section of Cook Inlet, as easterly winds push storm fronts up from the north Pacific and Gulf of Alaska into Kamishak Bay. It wasn’t hard for us to imagine the violent storm surges that had brought these huge tree trunks to their current resting points high up onto the beach, up and over the natural berm, inland onto the tundra, and even miles upstream along Amakdedori Creek. These frequent storms would pose a serious threat to the workers and infrastructure of the proposed port, along with the natural gas pipeline across Cook Inlet to the Kenai Peninsula. It was also evident from the multiple volcanoes around us that these storms wouldn’t be the only natural disaster that could damage these facilities… the Amakdedori Port and Cook Inlet gas pipeline would be located along the Pacific Ring of Fire (one of world’s most seismically active regions), and would therefore be subject to the constant threat of volcanic eruptions, earthquakes, tsunamis, and undersea landslides. In fact, the 1912 eruption of the Novarupta volcano in what is now Katmai National Park was the largest volcanic eruption of the 20th century (30 times greater in volume than the 1980 Mount St. Helens eruption). Our team returned home convinced that Amakdedori is the wrong place to put an industrial port and roadway to transport ore from the proposed Pebble Mine to Cook Inlet. 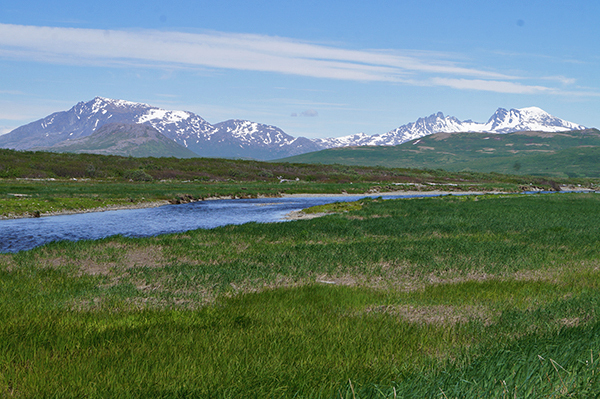 It was clear to us from our time spent on-location that this portion of the Pebble Mine project could potentially destroy a healthy network of interconnected streams and wetlands and have unacceptable adverse affects on wildlife, recreation, sustainable commercial fishing, and bear-viewing ecotourism throughout the Alaska Peninsula. We were fortunate enough to experience this place in person, and doing so only strengthened our resolve to protect this wilderness and the wild animals that depend on it. But time is running out for people like you and me to help protect the brown bears of southwest Alaska. Thankfully, nearly 220,000 WWF activists signed a petition against this proposed destruction of Alaska’s pristine habitats, joining Natural Habitat Adventures and WWF in our opposition to the Pebble Mine’s negative environmental impacts. The public comment period for the Pebble Project EIS ended on June 29, 2018, but there will be another opportunity to submit comments once the Draft EIS is released, scheduled for early 2019. Brilliant writing nick! Thanks nathab for all the support on this fight!